Addon-makers, keep yourself in hand! This addon adds 21 completely different unusual creatures based on redstone blocks. Here there are turrets, flying chairs, and even motorcycles. Each mob can be used for different purposes and have certain parameters. Most of them spawn in the ordinary world, and you will not be difficult to find them. Live Redstone mechanisms are divided into neutral, aggressive and defenders. 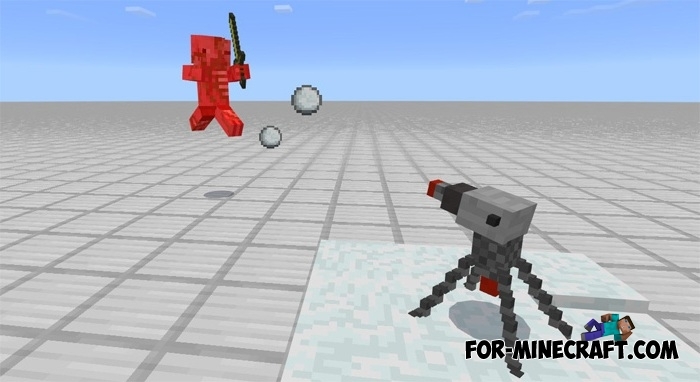 There is a new weapon with which you can resist aggressive redstone mobs. Now you will throw bullets instead of snowballs (yes, it does not look so realistic, but the bullets are better suited for this addon). Flying chair is the most neutral creature, even it is rather a mechanism. Using it you can fly above the ground instead of walking. Flying chair does not require fuel but you'll need redstone to control. It has a low speed but may be at a height of about one block. Therefore, steps will no longer be your barrier on the way. Hopper made of a conventional chest and attached funnel. As a result, a special machine was formed sucking any items lying on the ground. Try to use it in mines or at the sawmill. Funnel also works as a pet on a leash. Inventory can hold 5 objects. Redstone motorcycle is a two-wheeled vehicle. It has higher speed than the flying chair and a little stronger. The motorcycle may carry only one player, and has no trunk. 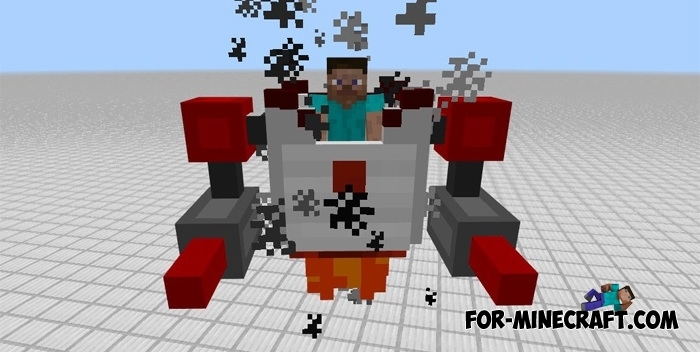 Dropper Robot is a walking machine that exchanges redstone dust for diamonds, emeralds, gold and iron ingots. Robot Engineer is the basis for creating other mechanisms (use ingots, coal and redstone to make the mechanism). Octobomb is an outwardly inoffensive square creature, but it remains neutral until you touch it. The octobombs do not know how to warn and can only explode by rushing at you like a kamikaze. Destroyer & Golden Destroyer. Both creatures will attack you in any situation. Gold type is more dangerous for you and is able to ride a motorcycle. Destroyer replaces the skeleton, so be prepared to meet them quite often. TNT Anator is another hostile mob. Moreover, it is a good reason to visit the Nether world. You will meet many such creatures on your way if you carefully dodge their shots. The Creator did not stop there and added the last aggressive mob is Necro. No, this is not an ordinary creature shooting with fireballs, it can fly. So for your safety you will have to look not only to the sides but also to the sky. Flyborg looks very ominous but it is very weak, you just hit it only a few times to kill. Pyroborg is its desert brother with similar parameters and a small threat to the lives of players. Redstone boss is the most powerful mob having 500 health points. Gather all the forces and fight with him because this is an excellent test of strength. Kinotone and Momotone are underwater and quite dangerous robots similar to turtles. They will rush at you if you swim very close. 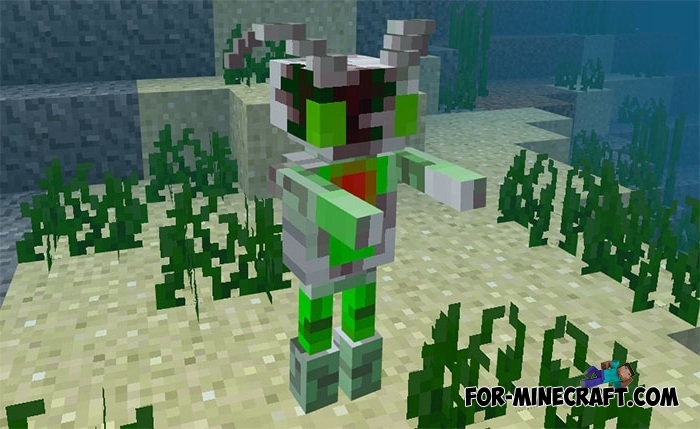 Sea Destroyer is a new mob from the last sixth update which is well visible under water thanks to its bright appearance. Beware of him if you do not want to use your fists in battle. Perhaps this is the most useful type of creatures. They will protect you and never leave you in trouble. Some may explode after death, it is better to stay away from them. 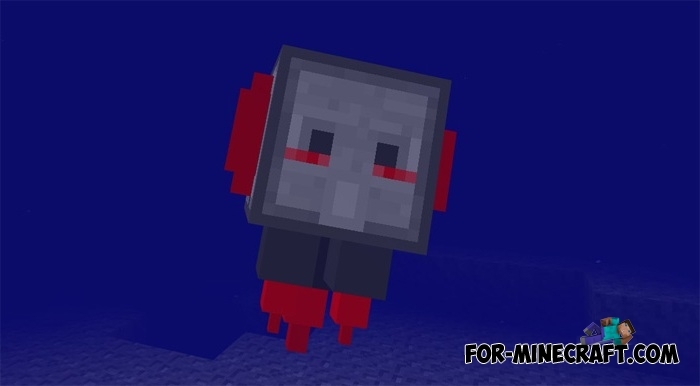 New Dispenser is very strong mob, which always attacks the hostile creatures and use different ammo. The damage depends on the type of ammunition and varies greatly. Spawn more dispensers and any enemy will be defeated in a matter of seconds. New Observer is a little brother of the dispenser but with other features. Oddly enough, but the observer has hands and feet, and attacks everyone except you. Turret. You can find several turret mods for MCPE on our website, but the Redstone Mobs aka Redstone Mechanic Addon adds turret originally with the same functions. Robo-scorpion and Mega Robo-scorpion live in almost all biomes of your world and pose a certain danger to you and your pets. The first type is not very strong and uses a sting to knock you off your feet, but the second type is ten times stronger than the first one. Avoid it if you want to continue your adventures, and players who love risk can experience the fate and fight with the mega scorpion, but the chance of winning is very low. Legion is a descendant of endermen so it got some of their features such as high height. His power is almost equal to yours if you wear iron armor and take a sword. Exoskeleton is the best remedy against other creatures in this addon. This robot is equipped with large cannons and can transport you anywhere. The ability to improve is a great opportunity to increase the strength of the jump (use coal). How to install the Redstone Mobs Addon? Download the file and open it using the game. Go to the world settings and activate it. 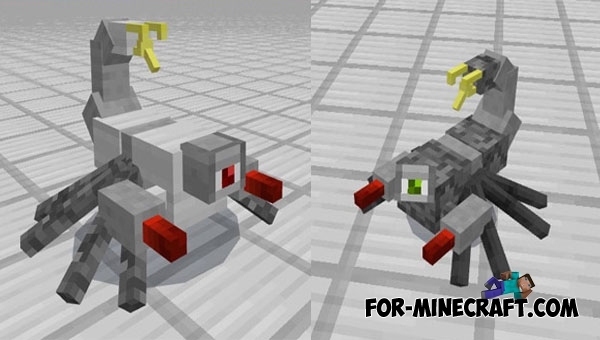 Mech Turrets Addon for MCPE 1.2The Mech Turrets Addon is four different colored turrets with different features and are perfect to protect you and your buildings..
Utility Turrets mod for Minecraft PE 0.17.0/1.0.0/1.0.2Utility Turrets mod adds 9 different turrets that will attack any enemy. So if you need a powerful protection, these turrets will protect you..
More Chairs mod v2 for MCPE 0.16.0/0.17.0Pretty nice addon for the MC:PE. With it, you will get 9 different chairs that can be used..